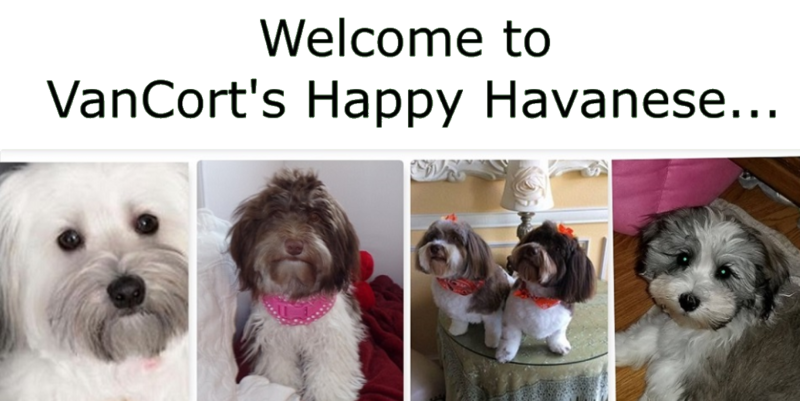 “The AKC is in possession of a letter from the HCA stating that any color and pattern in the Havanese is acceptable. Since Havanese are acceptable in all colors and patterns, we have tried to pick a reasonable palate to cover most probabilities. We are now allowed 20 colors and 7 patterns of color. We also are allowed an additional 10 ‘alternate’ colors and 3 ‘alternate’ patterns for those colors or patterns that just don’t fit in the regular 20 or 7. In order to use and register one of these alternate colors and/or patterns, you would write in your choice on the ‘other’ line of the registration and send a picture of the pup or dog along with the registration to the AKC office. A picture must accompany this if you chose to write in your color or pattern as an alternate. We are only allowed to pick one choice from the color side and one choice from the pattern side, (see the last page of this handout for a ‘quick reference’) and the new ‘colors’ will be different for most of us. Please do your best in making your decisions based on the choices you have. Cream – Cream will be used for an off-white puppy. This would have previously been registered as champagne. Most pups will display darker cream on the ears. Gold – Gold is a warm rich color of moderate intensity. These dogs have an apricot or light orange. Red – Red is an intense reddish orange. It’s also a warm color but is more intense than gold. Fawn – Fawn dogs are the cooler tans, buffs or brown tones. Black – Blacks are black with no reddish or brown tones or hairs. Chocolate – The only dogs with the liver colored nose and lips, and lighter eye color. Blue – Blue is from an almost black to a soft charcoal color. The hallmark of blue dogs is that they do not start turning from black to blue until they are a year old or older. Many times the blues have a dull cast to their coat as it turns from black to brown and finally to blue. Probably few puppies can be registered at blue since this coat change happens much later. Silver – Silver dogs can be from charcoal to a very soft light silver or pewter silver. These pups start silvering at an early age, usually after 4 weeks but certainly by 12 weeks. Sable – Identified by black tipping of the hairs on a coat of a different base color such as fawn or gold. The base color is identified by looking at the roots of the hair near the ‘scalp’. Brindle – Identified by any pattern of color that goes all the way to the roots, unlike sable where JUST the tips are dark along with a base color. Most Brindles have several colors going on, i.e. Silver, black, gold, cream. Brindles do not have to have the classic ‘striped pattern’ as previously thought, but they may. Often, brindles display a black mask. NOTE: If you put a sable dog in a puppy clip, you will cut off the black tipping and it will not grow back, except perhaps on the ears. Brindle would grow the color back since that is the color of the hair all the way through. There are varying degrees of sable tipping and some will keep more of the black tipping than others. Often only the black tipping on the ears remains as the dog grows older. With Brindle, while the base colors may lighten significantly, the colored hairs will remain throughout the body and not just on the ears. The colors listed below are the complete list of colors. These are the same colors listed above, but with the addition of either sable or brindle. This will be how you chose the colors of your dogs on registration forms. (1,2.) Cream; Cream Sable (we don’t think there would be a cream brindle but if you should get one, this would be a ‘write in’ with an accompanying picture to AKC, with registration papers. (14. 15.) Black; Black Brindle – black brindle: Black coat with auburn hairs. This is what was once thought of as “Havana Brown”. Black brindles have degrees of auburn with the black coat. They may sometimes display a lot of the Auburn coloring or very little. They may even appear to look like a rich dark Chocolate, but they will not have the liver colored nose. They have a dark black nose and pigment. Parti – Primarily white with markings of another color from above. Generally, more than 50% of the dog is white. Pied – Primarily a colored dog with any of the above colors with white markings concurrent with the Irish Pied pattern: White of varying degree on feet and/or legs, white chest and a full or partial white collar around the neck. The tail is also tipped in white. White Markings – Primarily an almost solid colored dog with a few areas of white, i.e. chest spots, toes, etc. of white. Cream Markings – same as white markings but with cream or tan instead. Silver Markings – same as white markings but with silver instead. Silver Points – Same as for tan points but with the silver instead. 1. A puppy who is born a Black Irish Pied with tan markings between the black and white would now be registered as Black and Tan Irish Pied. (think Bernese mountain dog colors, here) It is an Irish Pied, automatically tells you this dog has the white Irish Pied coloring. 2. A sable parti would now be registered according to his base color; i.e. gold, gold sable, or fawn sable etc. and then the pattern of parti. Please choose the color that will most likely resemble each puppy, AS AN ADULT. AKC wants us to register our puppies as how they will most likely look as an adult. NOTE: You may choose an alternate color and/or pattern in ‘other’ when filling out Registration Forms for new puppies if you have one that doesn’t fit any of the above, but you MUST include a picture of the puppy with the application to AKC. Sable: Dark tipped hairs on one of the base colors above. Only the tips of the hair are dark. Brindle: Various Colored hairs of any pattern, that go all the way to the root, with one of the base colors, above. Many brindles have a black mask. Brindles have several colors in them, so chose their ‘main’ color from what base color is growing in at the roots at time of registration.